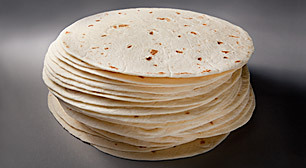 Our 6” flour tortilla is a classic standard, ideal for traditional tacos with cheese, lettuce and a protein filling. 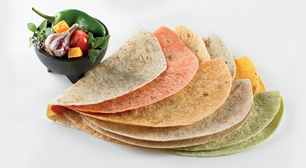 It also works great for fajitas and mini flautas—either as center-of-the-plate or a la carte offerings. Master Case Net Weight 18.00 lb. Master Case Gross Weight 19.09 lb. Enriched Bleached Wheat Flour (Flour, Niacin, Reduced Iron, Thiamin Mononitrate, Riboflavin, Folic Acid), Water, Vegetable Shortening (Interesterified Soybean Oil, Fully Hydrogenated Soybean Oil), Contains 2% or less of the Following: Sugar, Salt, Leavening (Sodium Bicarbonate, Corn Starch, Sodium Aluminum Sulfate, Calcium Sulfate, Monocalcium Phosphate), Vital Wheat Gluten, Mono- and Diglycerides, Potassium Sorbate and Calcium Propionate (to preserve freshness), Fumaric Acid. Contains: Wheat.